Extreame Savings Item! Save 47% on the Dmeixs Hanging Stroller Toys, Infant Teether Toys Squeaker Crinkly Ear,Baby Stroller Toys Colorful Car Seat Rattle Toys,Rabbit Toys Stroller,Car Seat,Infant Bed by Dmeixs at My Pregnancy Place. MPN: DX18720-TZC. Hurry! Limited time offer. Offer valid only while supplies last. Teether Leaf -- Made of non-toxic, BPA-free and reliable material, help sooth your baby through the growing pains of having his/her teeth come in. Teether Leaf -- Made of non-toxic, BPA-free and reliable material, help sooth your baby through the growing pains of having his/her teeth come in. Practice Grabbing Ability -- Colorful cute rabbit bunny with will catch baby's eye attention,then they will try to grab it and play it.keeps their interest more than other toys. Good Size -- Total length of 12.59 inch perfect for long car rights and it has multiple different surfaces for exploration. Function -- The bunny has crinkling ears, mirror, teether, rattle, belly with squeakers and colorful shapes grab onto. It is basically an all in one toy for baby interests at this age. Washable -- Washed in the washer and hang dried-ready to play with the next day! Carrot mirror:safety carrot mirror have baby enjoy self-discovery. With a big hook could be used for car seat,stroller,baby bed ect. 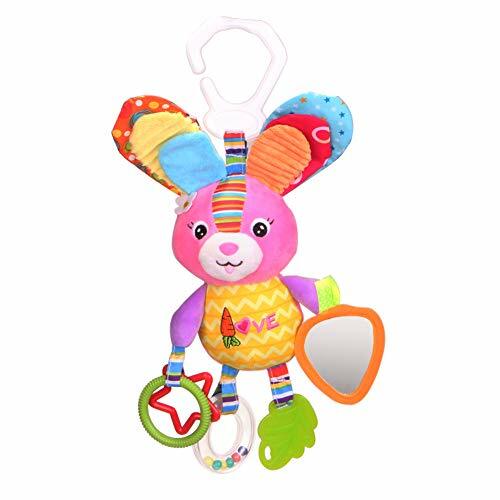 Colorful shape:the bunny with lot of colors,colorful crinkling ears,green teether,red star ring,with colorful beads of rattle ring,orange safety carrot mirror,and the colorful body shape. Crinkling ears: The bunny's ears could make noise,crinkling sound could catch baby's interest. Teether:the green leaf and the red star,green ring are safer for kid to teeth when playing with it. Rattle Ring: the bunny's rattle ring with colorful beads could make noise,easy to draw baby's attentions. Belly Squeaker: the bunny belly with squeaker could make noise,another feature to catch baby's interest. If you have any questions about this product by Dmeixs, contact us by completing and submitting the form below. If you are looking for a specif part number, please include it with your message.